My usual topics are about food or China but today I want to share some good information with you. 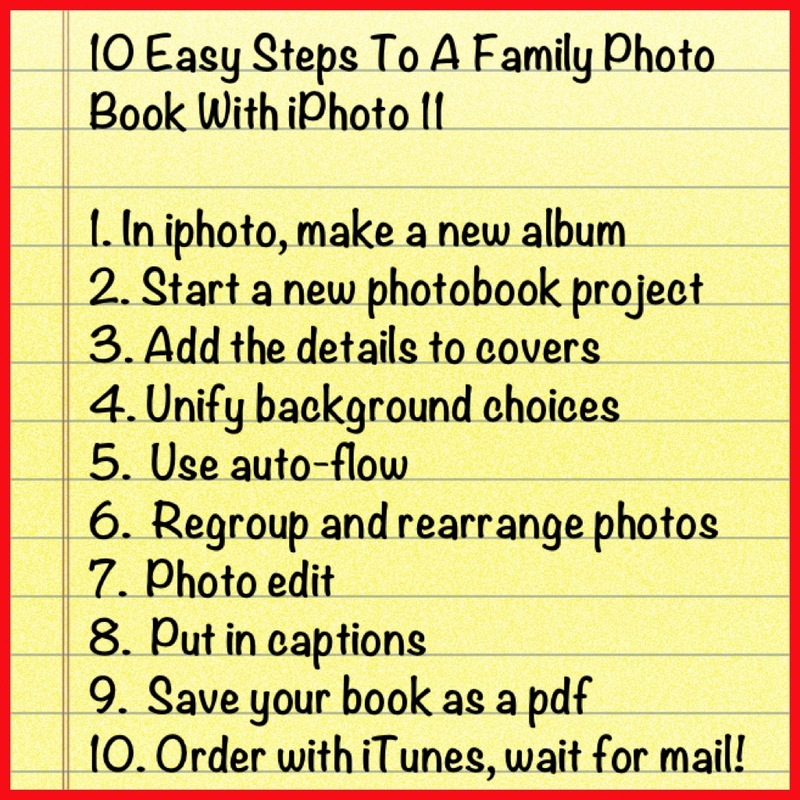 You will find it helpful if you have planned to make a Family Photo Book. This is my second photo book with iPhoto 11 since I just upgraded from iPhoto 9. If you find this useful or not, please take a little time to give me your feedback! Making a family album of your old photos can be a daunting task because if you’re like me, the sheer volume of photos and most without dates or names can be scary to attempt. There are many good tutorials on how to use iPhoto so I won’t bore you with those details. But I do have a way to simplify the process. My project started with a selection of over 500 family photos ranging in dates from the early 1900’s all the way through to the early 1980’s. I had each decade of photos in individually labelled Ziploc baggies. Paying to have them scanned was a huge time-saver. Having them scanned and named by decade helped to keep them in a sort of chronological order. I also made a separate pile for photos that needed to be scanned on the back for those that have handwritten inscriptions, or ‘love notes’, as I found with my parents’ photos, sent to one another while my Dad was in the UK during WW2. From there, the work of making the photo book became my task; and with iPhoto it just couldn’t be easier. I know this from past experience. Over the years, I’ve made many photo books, choosing a variety of photo book companies from a vast array available online. I’ve used Blurb.com, treasure-books.com, shutterfly.com, iPhoto (Apple.com) and PhotobookChina.com. With the exception of the last, they have all made a beautiful finished product. 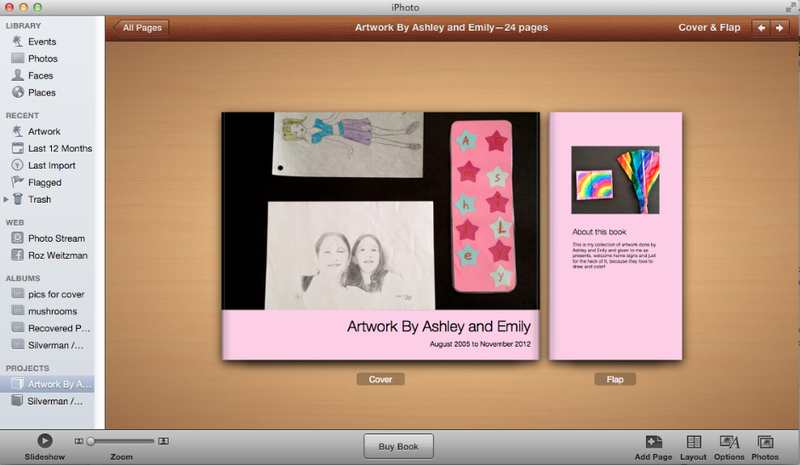 My other iPhoto 11 photo book was a compilation of my granddaughter’s art from the past 8 years and I have a screen shot of it at the end of this post. I used the same method but didn’t put the photos of the art in chronological order. Next time! But satisfaction difference has been in the ease of use of the software. Having the photo software on your computer means not having to rely on a slow Internet connection or losing your work as one terrifying factor. The other would be the way the software is user friendly and predictable, and the interface at the ordering process is so uncomplicated. 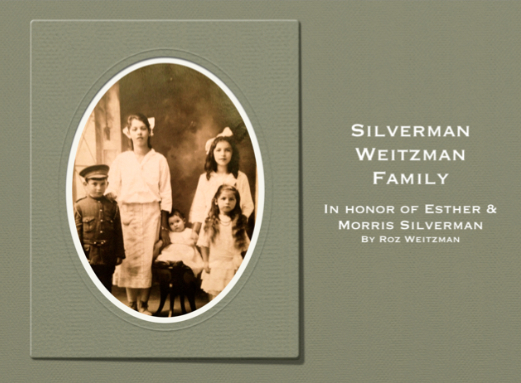 So my recently completed Silverman/Weitzman Family Album on the way to be processed and I have compiled this list of how I got the project finished. Read on…! – Gather your photos into one event; only selecting the best of a series of several of the same poses to reduce the amount of photos. – When you use Auto-Flow, having the names of the photos in sequential order will be very helpful, especially when you switch from one family group within the bigger family. – Select the photos for the front and back covers and inside jacket covers and backs. – Choosing photos of the matriarch and patriarch of the family by cropping their faces out of an old photo is great way to highlight their contribution to the family. Add the text as required, or leave that to later when you add captions and inspiration comes naturally. – The most interesting photo books focus on the photos and not the extras, so it’s best to have all backgrounds the same colour/style to unify the book. – With iPhoto there are many choices for faming each photo that can be changed later. – Use autoflow to insert all photos into the book, it’s the most efficient way to begin your photo placement. – It gives you a good place to start and a feeling of some accomplishment! – Starting at the first page go back and replace and regroup photos as necessary, since sometimes photos are not in the exact order that you chose to begin with. – Autoflow tends to put more pages with less photos on each page. I like to group same-event photos onto layouts of 3 to 6 photos. – Select layouts without captions at the bottom or side of the page when possible. – There are so many custom layouts to choose from if you scroll down in the layout drop down list. – Use the photo border that has the caption at the bottom of each photo. This gives you a larger photo size and less unused blank space. – Including a last page with the dates of birth/death of each old family member helps future generations with all this leg work that is sometimes a futile effort because those folks are no longer alive. – Go back and change all the photo colours: For black and white photos that are very old, the ‘antique’ colouring shows the photos off to their best. – At the same time, make the photos larger within the frames and centre them to look their best. – Go back to the beginning again and put in all captions, using the same fonts and colour. – In the text function, select the font, colour and style for all captions by clicking the check-off box. Some captions are longer than others, requiring a smaller font. – Verify the dates of the photos by looking at the originals on the front and back. – Once dates are verified, you may want to move some photos around one last time. – Save your book as a PDF and print it out in PDF format on regular paper and in black and white to make sure there are no typos, name or date mistakes. – Make the changes to the original document in iPhoto. – Save as a pdf again for other family members to view in advance of the final printing. 10. PLACE OUR ORDER USING YOUR ITUNES ACCOUNT AND WAIT PATIENTLY FOR THE MAIL! – Order your photobook using your Apple iTunes account. – Patiently wait for the courier/mail to arrive! Please take a moment to give me your feedback in the comments section. Thanks and happy photo booking! Family History Month is long past but what better time to work on a special genealogy project during the winter months? There’s time to organize papers and display old photos, or work on your own research during the dark days of winter. Here are some ideas. Scan that collection of old photographs, and choose some to display in a digital photo frame. Write captions and identifying information on labels to put on the back of old photos. Then read Protect and Preserve Old Photographs to find out how to care for them. Make a photobook and give to your grandchildren. Letters and journals from ancestors are a great find, but your children and grandchildren would like to know about you, too. I recently began my memoir journey by writing about my life, starting from childhood and on into the present. I jotted down all the experiences, memories, details and feelings about my life and hope to continue to produce my memoir in book form. Write about your best friend in high school. Write about the first date with your spouse. Write about how you got interested in genealogy. Write what you were doing when you heard about the shooting of President John F. Kennedy. Write about another memorable event in your life. Ask your parents or grandparents the same questions and write their responses. Make copies of a favorite ancestor’s photo, put in small, light frames, and give as Christmas tree ornaments. Create a montage of ancestors’ photos, or photos of current family members, and give as a gift. Write the story of one ancestor’s family and give to family members. If possible, include a photo of them or something related to them. Recently my younger cousin asked me about my uncle, he dad, who passed away early in his life. He also wanted to know about our grandparents, whom he had never known. In addition to my brother’s memories, which are few, I can give him my story about our grandparents to make it real for him. Create a digital scrapbook page of an ancestor’s story, plus photos and excerpts from documents, and print as a gift. While my father was in Britain during WW2, my mother and father who were engaged before he left, sent photos back and forth. They both wrote love letters on the backs of the photos. I am going to include those inscriptions in the photobook. The younger generation in our family does not know the rest of our family descendants from our great grandparents. We are planning a spring reunion to get together, share family stories, look at old photos and have fun. Create a Family Group on Facebook and find lost relative, little know facts, and with everyone’s input, plan a reunion or just simply stay in touch. I’m on a phase in my life where my family’s past is of great importance to me. 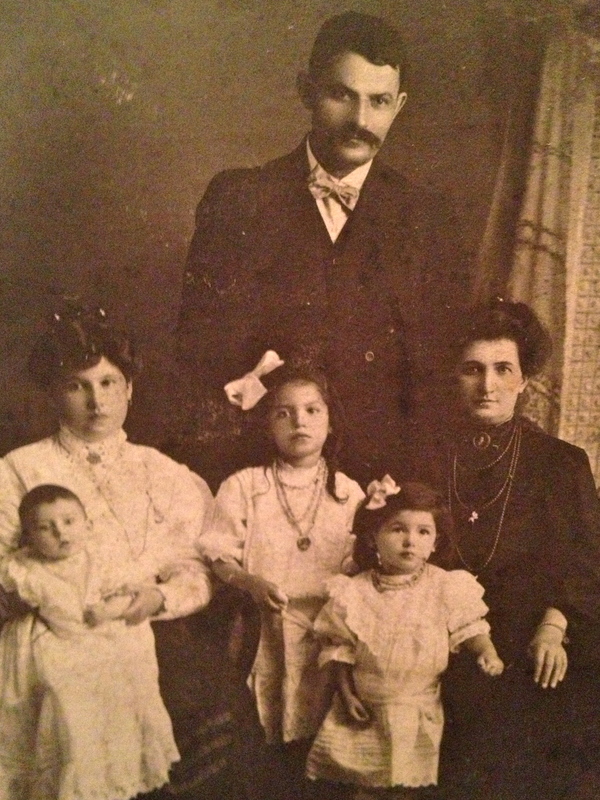 Knowing details of family events and life 100 years ago is of great interest to me. Perhaps it’s the same for you!